Signing up with Atlas means getting more than just timely and affordable delivery of your fuel; it also means benefiting from our industry-leading technological solutions. At the center of those solutions lies the FuelNow Network (FNN), a cloud-based platform that automates the supply chain and streamlines the fuel delivery process. Through the FNN, Atlas is able to manage and monitor every single delivery we make, even those executed by one of our exceptional third-party carriers. What this means for you is that you won’t ever again have to put up with excuses for why your delivery was late or didn’t include what you ordered. The FNN allows for real-time delivery monitoring, so we’ll always know exactly where your truck is and what it’s carrying. What’s more, that same network also allows for accurate customer invoicing and automated reconciliation. Once you receive your fuel, you’re going to want a way to keep track of where it’s going and how it’s being spent. That’s where our RioS cloud-based fuel management systems come in. Fuel Tanks that make use of this technology can connect to a fully-integrated cloud platform that allows fleet managers like you to track every gallon dispensed by unit, examine consumption metrics and manage inventory levels. Imagine if, with the push of a button, you can control your fuel pumps and know exactly how much fuel remains in your tank. With that sort of information, you’d know exactly how your fuel is being used and when more needs to be delivered; you could lend your fleet operations the sort of efficiency that’ll save your business hours of wasted time on a daily basis. 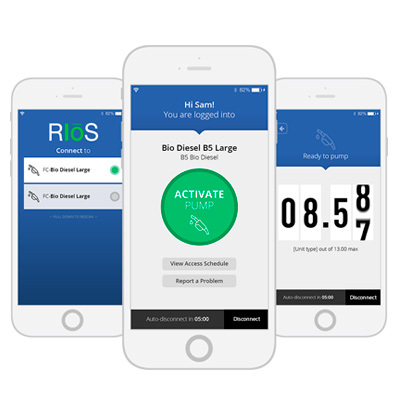 RioS offers you the ability to take control of every aspect of your fleet’s fueling operations, and it offers that ability at a fraction of the cost of traditional fuel management systems. As an owner of a fleet-based company, you know that countless processes go into the daily operation of your business, processes that are your responsibility to vigilantly monitor. But what if you didn’t have to personally manage each and every one? By making use of our wireless tank technology, you can let Atlas keep track of how much fuel is left in your tanks and schedule deliveries when those levels get too low. Atlas can even identify changes in usage patterns to automatically adjust the frequency and nature of your deliveries. What’s more, that same technology allows you to monitor your fuel inventory through any computer or mobile device with an Internet connection, giving you the power to exercise control when you need to. Make run-outs and emergency deliveries a thing of the past; take back your time and put it towards growing your business. Find out how Atlas Oil can help you and your business with our fuel monitoring systems.